Wells Fargo is still struggling to shake off a bad reputation it earned through numerous recent scandals. 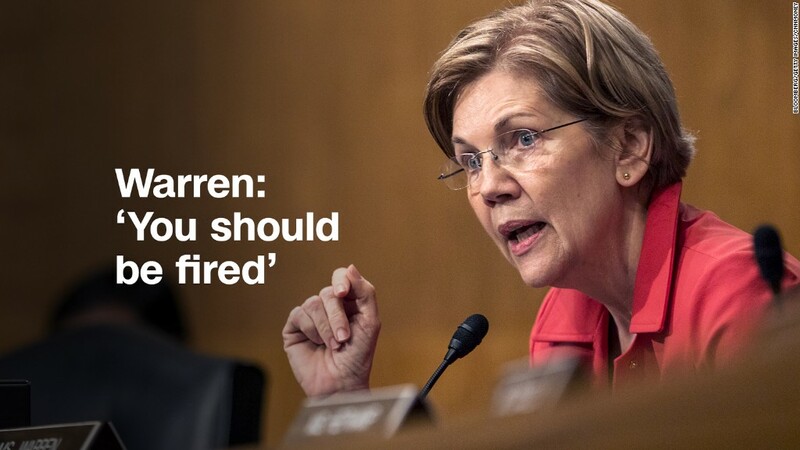 Senator Elizabeth Warren told CEO Tim Sloan at a hearing on Capitol Hill Tuesday that he should be fired. Wells (WFC) will have a chance to show Wall Street (if not necessarily politicians or consumers) that it is trying to get back on track when it releases its third quarter results on Friday October 13. The earnings aren't expected to be all that good. Investors anticipate profits to remain unchanged from a year ago. Despite being a favorite bank of legendary investor Warren Buffett, Wells's stock in a serious funk -- up less than 1% this year. By way of contrast, several other big banks -- including JPMorgan Chase (JPM), Citigroup (C), Bank of America (BAC) and PNC (PNC) -- are all likely to post decent gains in earnings when they report their third quarter results next week. JPMorgan Chase stock is at an all-time high. Bank of America and Citi, while still below their pre-2008 financial crisis peaks, have both soared this year and are well above the low points they hit in March 2009. These are good times for banks, despite the headaches at Wells. Interest rates are starting to creep higher, and the market expects another rate hike from the Federal Reserve in December. Higher rates help to boost bank profits because banks can make more money from lending. At the same time, rates aren't so high that they are scaring off consumers. There is still decent demand for mortgages, credit cards and auto loans. Default rates remain low thanks to continued growth in the economy and a low unemployment rate. Tax reform is a wild card, of course. If President Trump's administration is able to come up with a plan to lower corporate taxes, that will certainly boost the big banks. Still, there are some concerns on the horizon. It's not clear, for example, if Republicans in Washington will undo the Obama-era Dodd-Frank financial reform bill that some banks argue has made it tougher for them to do business. The House voted on party lines this summer to pass the Financial Choice Act, a bill that effectively neuters much of the more restrictive parts of Dodd-Frank. But the Senate has yet to vote on its own bill. Another problem? Strangely enough, the stock market might be doing just a little too well. The surge in the market this year has been accompanied by historically low volatility. That's likely to hurt trading revenue for the firms that have significant Wall Street operations. Goldman Sachs (GS) and Morgan Stanley (MS) will provide more details about that when they report earnings on October 17. Goldman has missed out on the big bank rally. Its stock is up just 1% this year while Morgan Stanley's has gained more than 16%. Related: Has Goldman Sachs lost its golden trading touch? At the same time, demand for new stocks has been sluggish lately even though the broader market is soaring. There was a dearth of high profile initial public offerings in the third quarter, and that could hurt investment banking revenues too. The hope is that the successful IPO of streaming video device maker Roku (ROKU) last month could reignite the IPO market, which has struggled a bit this year due to flops like Snap (SNAP) and Blue Apron (APRN). But for now, investors are hopeful that the positives, as well as optimism for tax reform, will outweigh some of the negatives for JPMorgan Chase, Citi, Bank of America and other big banks not named Wells Fargo.